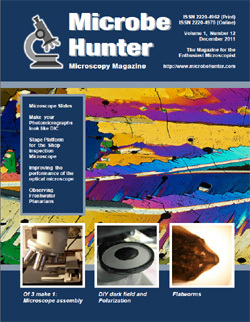 Welcome to the 10th issue of MicrobeHunter magazine. You can download the PDF and order a printed version. My perfect microscope is assembled from 3 junked and discarded units. Everything you ever wanted to know about glass slides! Some simple adaptations to the microscope can dramatically improve its performance. In this article the author explores the possibilities of darkfield and polarization. These little flatworms are ideal specimens for low-power microscopy. The “shop inspection microscope” is a small monocular microscope using top-illumination. In this article the author describes the construction of a stage platform, which makes transmitted-light observation possible. Differential Interference Contrast (DIC) optics produces beautiful images that appear 3D. These optics are also very expensive. Luckily it is possible to achieve a DIC-like effect with PhotoShop’s Emboss tool.